School and district My BrainPOP administrators can set up Single Sign-on with G Suite for Education, simplifying teacher and student onboarding. School and districtwide subscribers that also use G Suite for Education can install BrainPOP, BrainPOP Jr., and BrainPOP ELL SSO apps in the Google Marketplace. Teachers and students on your school or district G Suite domain are provisioned into individual My BrainPOP educator and student accounts the first time they log into BrainPOP using the G Suite launch. If you are a G Suite Super Admin for your school or district domain, you can install and configure the apps for your teachers and students. The apps use Google’s Organizational Units (OUs) to provision teachers and students into schools. After installing the app and linking your BrainPOP subscriptions to your G Suite domain, teachers and students can log in directly on the homepage with their G Suite accounts. Alternatively, teachers and students can log in from Google Apps, by selecting the waffle icon and then choosing Even More. If your teachers are organized into separate Organizational Units for each school, use the BrainPOP Google SSO Set Up (with provisioning) Step Guide for instructions. If your teachers are not separated into Organizational Units by school, teachers and students can provision their accounts on the fly. Use BrainPOP Google SSO Set Up (no OU configuration) Step Guide for instructions. If you have students and teachers on separate domains, contact us. Once your domain is set up with SSO via G Suite, teachers who log in with the app and also use Google Classroom can import their Google Classroom rosters into My BrainPOP on demand. For instructions, see Rostering with Google Classroom. I’m a school administrator, but my G Suite domain is for the whole district. Can I set up the integration? Integration setup requires administrators to link your G Suite domain to your BrainPOP subscriptions. If you have a district-level domain, a district G Suite Super Admin can use your district level username and password to link. 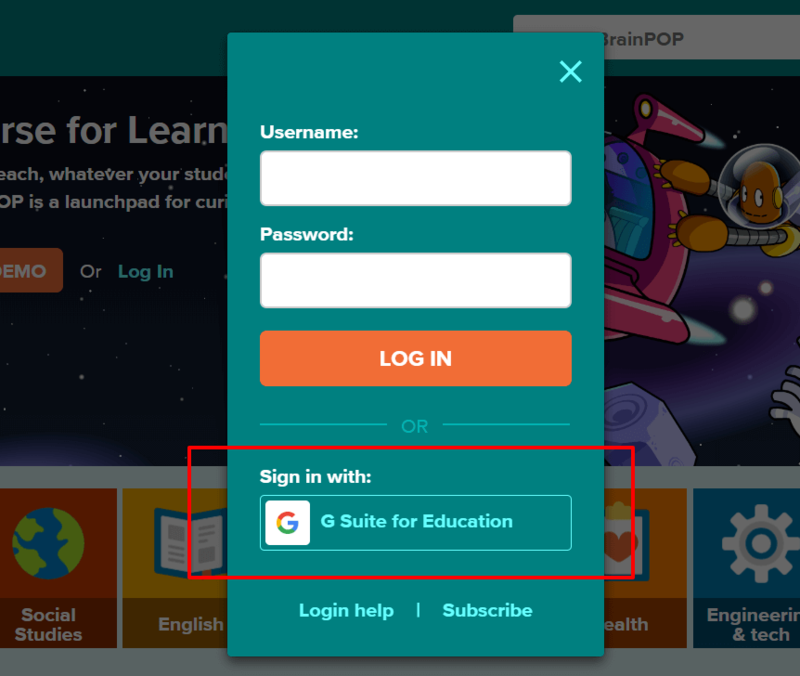 If both your BrainPOP subscription and your G Suite domain are on the school level, you can link your school subscription directly to your school domain when you install the app. We already have an SSO integration set up with our LMS. Can we set up G Suite too? There are teachers and students in my school/district already using My BrainPOP. When I set up the integration, can they continue using their existing My BrainPOP accounts, or do they need to create new ones via SSO? When teachers and students who already have My BrainPOP accounts use the SSO app for the first time, they will be prompted to match their existing My BrainPOP accounts to their G Suite accounts. They will not need to create new accounts and they will not lose any of their classes, assignments, or submissions. Why can’t I find the BrainPOP app in the Google launcher (waffle)? If the app has been installed, but you do not see it under ‘Even More’ when you access the Google launcher menu, check to make sure that you are accessing the menu from a Google App like Gmail, Drive, or Calendar. 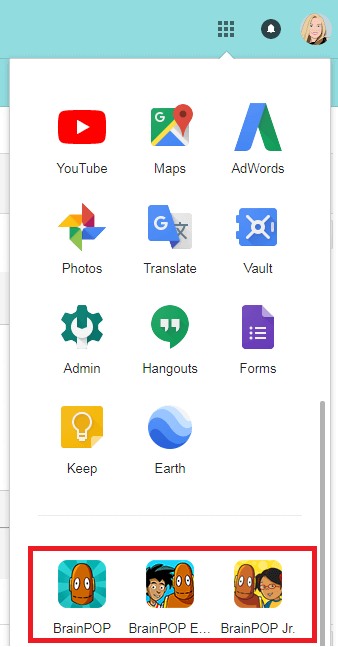 If you are on the Google homepage, for instance, you will not see any of your Marketplace Apps, which require you to be logged into a Google App.